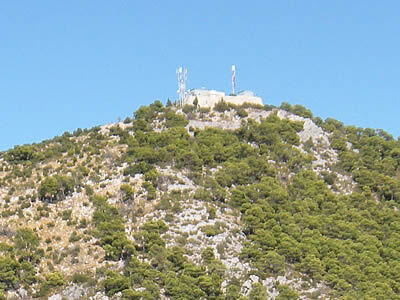 In Hvar’s Napoleon Fortress is a seismological station, part of a network covering the Adriatic coast from Rijeka in the north to Dubrovnik in the south. In fact they are all part of a larger international network that is responsible for monitoring earthquakes throughout the entire Mediterranean. Set up in 1973, the HVAR station contributes to the ongoing research into the movement of tectonic plates, providing seismic and GPS data. It seems that we hear about serious earthquakes in Italy quite frequently, but not so much about the eastern side of the Adriatic. Is there actually less activity, or is it simply because we don’t read Croatian newspapers? Well, yes and no. Earthquakes do occur in the Adriatic region, but they’re less frequent than in other parts of the Mediterranean. Countries such as Greece, Italy and Turkey, for example, regularly seem to have destructive quakes. But you’d have to go back a few decades to come up with similar events on the Croatian coast. I have to mention here that I’ve been fascinated by plate tectonics since I first read about it in the late 1960s. Other people love astronomy and watching the stars – me, I love this planet and the dynamics of how it came together. That’s probably got a lot to do with why I paint rocks! So here’s my potted version of the geophysics of the Adriatic region and where it’s all going. The African plate is moving north into Europe, pushing Italy ahead of it. That’s why we have the Alps, and the Dinaride mountain range along the Croatian coast. But the African plate doesn’t just start at the African coastline, it actually incudes a large chunk of the Mediterranean basin, and a piece of Sicily. The boundary faultline runs through Sicily, which is why they have volcanoes around there! Meanwhile, Italy itself is split up the middle, with the west coast moving NW, and the east coast moving NE, along with the rest of the Adriatic. That fault up through central Italy is where they tend to get earthquakes. Over on the east side of Italy, opinions differ as to where the boundary of the African plate lies. 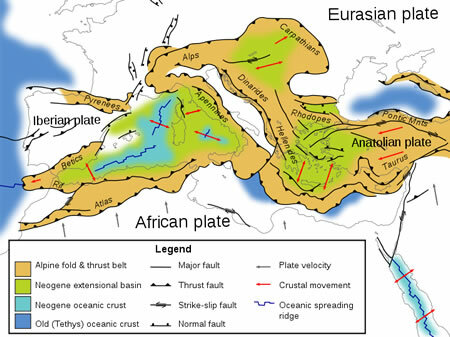 Some say that the whole Adriatic basin is actually part of the African plate. Current best guess is that Apulia-Adriatic is a separate micro-plate, generally moving NE, but is also rotating ever so slightly anticlockwise – so the movement is smaller in the north, larger in the south. I say larger movement, but we’re only talking about 4-5 mm a year as opposed to 1-2 mm. In another 50-70 million years or so, Italy will park itself neatly alongside the Croatian coast and the Adriatic Sea will be closed. Sad, really. The Adriatic islands, including Hvar, will be high up on the continental plain! So what does all this mean for the Adriatic now? How seismically active is the Croatian coast? Historically, the most famous seismic event in the area was the great Dubrovnik quake of 1667, which devastated much of the town. That was well documented, and has been estimated at intensity 10 (Mercali scale, based on the damage done and contemporary reports). It’s possible that the Adriatic micro-plate boundary lies somewhere under there, which would explain the extra seismic activity in the area. 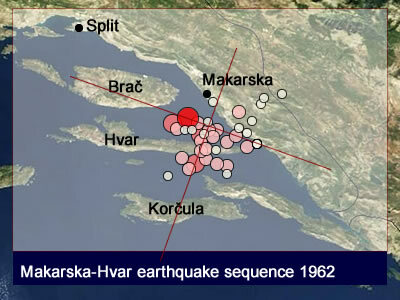 On Hvar itself, the seismic station was set up following a series of earthquakes under the channel between Hvar and Brač. The largest quake, on 11th January 1962 registered 6.1 on the Richter scale, following a 5.9 four days before. The shocks were felt strongly on the mainland, and this is generally referred to as the Makarska-Hvar or Biokovo earthquake sequence. The series was important, as it was the largest seismic event in the region to be recorded and analysed, providing a better understanding of the local faults and movements. In 1937, there was a series of earthquakes closer to Stari Grad on Hvar, but felt also on Vis and Brač, and as far north as Split. Reports of the time describe sharp vertical shocks, accompanied by a deep rumble. Masonry was cracked in houses and churches throughout Stari Grad, Jelsa, Vrbanj, Svirče, Pitve and Vrboska, and one of the cupolas of the church in Vrisnik collapsed. Fishermen near Vrboska noticed that “fish made the water stormy” and they felt a strong blow from below. Other fishermen on the southern coast said it was if some kind of force lifted rocks above the water, then set them back down. The main quake on 20th July was estimated to be 5.2 on the Richter scale, with aftershocks continuing into December that year. From 1510 there are reports of an earthquake in Hvar: ” In the first days of February 1510 a strong heavy winter Jugo blew. Then on 6th February the sky went dark and a strong rain poured, lasting all day. Around 7pm the ground shook three times and the roof of the church of Anuncijeta in Burka collapsed.” I like the association of cause and effect of the elements here, in the same way that Californians will refer to heavy rain as “earthquake weather”! The HVAR station is run by the Geophysics department of Zagreb University. The science of seismology has a proud history in this country. The eminent Croatian geophysicist Andrija Mohorovičić proved the existence of the boundary between the Earth’s crust and the mantle by analysing the data from the Pokupsko earthquake of 1909. It’s been so long since I came by, but I like this! Can we actually head up to the Fortress? I’ve recently visited a fort and found it amazing, would love to see more if possible. I’m not sure if you can visit the Napolean Fort without making special arrangements. I might try to find out since it has such interesting stuff! The famous fortress above Hvar town (and the one every tourist visits) is Fortica Spanjolo – the Spanish fortress – a 16th century fortification with glorious views over the town, the harbour and nearby Pakleni islands. Well worth the climb! Now you mention it, I should do a photo blog about it! Yes please do, I’ll definitely be on the lookout of the updates here! I’ll love to check out the fortifications and maybe read about their history 🙂 Thanks for sharing!